It's freaky Filipino fairytale time in this incredibly bizarre offering that conjures up a nightmarish world of dark creatures that would not look out of place in a Jim Henson work shop at Halloween. A circus magician named Jamir sees his own daughter disappear for real during his stage act and has to seek guidance from a greater power to retrieve her from the other side. Jamir goes deep into a mist enshrouded forest to locate the high priest of mystical magic, the one known as The Prophet. His magic mojo is most powerful , but boy could he do with a hut cleaner with a magic mop to clean up after him! The Prophet leads the way into the realm of black magic by inducing the spirits of the occult brought on by munching down on monkey brains. Cerebral sorcery or just plain old monkey business it matters not as Jamir gets a glimpse of what lies ahead in getting his daughter back. The grey matter gets passed around for a monkey munch down with an extra big portion for The Prophet, it is after all his supper time! Soon Jamir’s wife is also snatched away into the alternate universe leaving just him and his young companion to go forth in search of the dark realm. A world where freakish man monsters and twisted creatures inhabit and a powerful queen rules over human kind. Queen Mikula seeks revenge over the birth line of Jamir’s family tree, back to his grandfather who imprisoned her for practising the black arts. Mikula was Jamir’s grandfather’s disciple who learnt all she could from him before choosing to take the path of evil. Cast out to the alternate dark universe Mikula spent a hundred years embracing evil and planning revenge, holding the Jamir family accountable in her dark heart for her imprisonment. The personification of embitterment her faded looks and pulsating forehead give away her rancorous intentions. With an old school horror Universal Studios overlay special effect the ghostly apparition of Jamir’s grandfather appears to him to tell him what he must do in order to save his wife and daughter, as well as ending Mikula’s hold over them. Arming him with an amulet that forewarns of danger, and the ability to glow when close to Mikula’s realm, Jamir prepares to continue his trek with his newly gained state of the mystical art global tracking system. The path ahead has many dangers though and when a behemoth of a man wielding a giant sword jumps out to attack Jamir needs more than a flashing artifact to show him the way to safety. Out of the forest mist steps the forest guardian, Mother Nature’s answer to Xena warrior princess. Sporting a Linda Evans set of shoulder pads from the Dynasty left over bins lady Kleriga comes to Jamir’s aid and takes down the giant with her magical eye lasers. Blink and you’ll miss it, she blinks and heaven knows what those lasers might do! Like the White Witch from ‘The Wizard Of Oz’ Kleriga points the way for Jamir to take and with a click of her heather heels she pops off , no doubt back home to cook a nice fruits of the forest soufflé for Mr. Kleriga. Meanwhile a glimpse into the world that queen Mikula rules supreme conjures up an evocation of Dante’s inferno, as a hellish hue of Technicolor terror regurgitates itself in a pulsating pit of purgatory. Sets of garishly garnished colouring add to the bizarre themed visuals, complimented by suitably tacky Halloween costumes and multi layered lashings of mouldy make up. 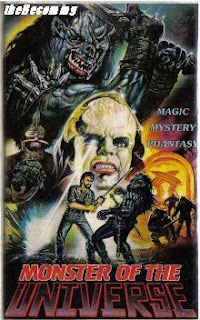 The myriad of monster masks completes the murky mirage of this fabulous flip side of ultra low budget movie making , and one to revel in its intentionally craptastic inventiveness. This is high camp horror humour at its highest form that dares not to take itself serious at all. Highlighted perhaps in its true intentions with the bizarre rendering of a monster mash disco party down at queen Mikula’s den of despair, where the monster band plays its funky jive upon instruments made out of human bones, and a karaoke king creature M.C. gets on down to the ghoulish groove. Jamir eventually gate crashes the party and armed with a magical laser throwing weapon of his own has an energy beam ‘blast’ dance with Mikula. Watch that head of hers pulsate to the blasting beat and Jamir groove on down to the elements of truth and justice as he combats the forces of evil. This truly is the ‘Magic Of The Universe’ in more than just title. Discovering such fantastical weirdness from the Philippines is a reward in itself. 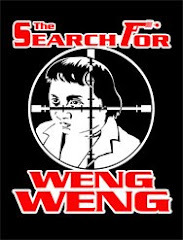 Add to this magical filmic pot a tribe of quizzical pygmies, a swamp Zombie who gets picked on just for wanting a taste of prime Filipino fillet and a whole host of back lot non aired pilot show monster rejects, and you have sure fire matinee madness for a late night showing shindig. Jim Wynorski, eat your heart out.